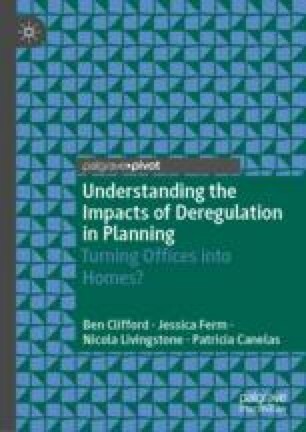 This concluding chapter sums up our findings in relation to the deregulation of the planning control of office-to-residential change of use in England. Our evidence suggests that government’s original impact assessment of the policy in 2013 was flawed, and permitted development (PD) is leading to the development of very low-quality housing, sometimes in poor locations, and which does not contribute towards the costs of associated social, physical and green infrastructure to support the development. Instead, the policy is acting as a ‘fiscal giveaway’ from the state to private developers and landowners. The necessity of the deregulatory approach is also called into question, drawing on our evidence from Scotland and the Netherlands. This leads us to suggest that planning reform in England in future should take a more positive approach, which helps deliver the housing needed and making sustainable use of vacant buildings whilst actually helping to create sustainable communities rather than the negative deregulatory approach which has dominated in recent years. DCLG. (2013). Relaxation of Planning Rules for Change of Use from Offices to Residential: Impact Assessment. https://www.gov.uk/government/uploads/system/uploads/attachment_data/file/207922/Relaxation_of_planning_rules_for_change_of_use_from_offices_to_residential_-_impact_assessment.pdf. Accessed 1 November 2017. Jones, R. (2018). As Small As 13 sq metres: Are These the Worst New Flats in Britain? https://www.theguardian.com/money/2018/aug/25/flats-block-converting-offices-living-space. Accessed 3 September 2018. Van Lerven, F., & Welsh, M. (2018). A Deregulatory Agenda Is Sweeping Across Europe. https://neweconomics.org/2018/08/deregulatory-agenda-sweeping-across-europe. Accessed 3 September 2018.